30th: Food Gifts – Do you like to give food as a gift? Or receive? Show/tell us! Why yes, I love giving and receiving food as a gift! Sometimes it can just be something little, or something from somewhere exciting. Other times it can be a big box of goodies! I love participating in package swaps, where you get to experience the joy of both giving and receiving a fun food box! Back in July (so long ago, I have been remiss in taking so long to post it, but it works well with the prompt), I did a package swap with the wonderful Cadry from Cadry's Kitchen. 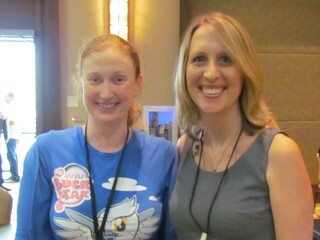 I was so excited to actually meet Cadry at VidaVeganCon last year. Here we are! But you all want to know what was in the box, right? Well, so many good things! 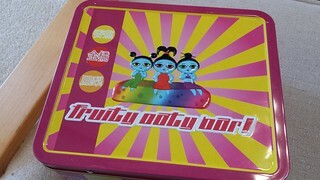 For starters, when I opened the box everything was actually tucked snug inside this fantastic Fruity Oaty Bars lunchbox. My old lunch box is falling apart, so this was timely! 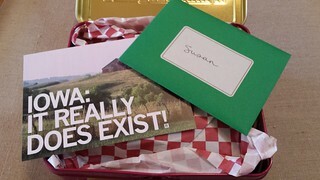 Within the box, there was a letter, a package, and a cute Iowa postcard. Iowa is were Riley Finn comes from in Buffy, but most importantly it is where Cadry lives! Behold the insides of the box! Photo credit here goes to Cadry. And yes, that is an adorable pack of vegetable-shaped erasers in a little grocery bag up in the top right corner. Lots of chocolate, which I approve of. Including my most favourite and beloved Justin's Dark Chocolate Peanut Butter Cups. I am obsessed with these, they are the only peanut butter cups worth eating in my opinion. There was also some delicious Endangered Species Dark Chocolate with Almond and Cranberries, which passed my very specific dark chocolate requirements (nice and rich, not too sweet). Some Peanut Butter Nonos, which were great (I had some earlier in the year that I brought in Australia and they were weirdly bitter, but these ones had none of that). And some Dark Chocolate Little Secrets. 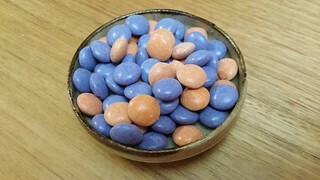 If you haven't heard, Little Secrets are blowing minds as the best vegan M&Ms around. They also have some fun flavoured ones (though not all of them are vegan, so check before you much). These lived up to the hype, they were great! Sitting just under the erasers in the photo is a little bubble-wrapped jar of locally made strawberry and rhubarb jam. I love that Cadry sent such a local product, though I am sad that I can't get it here because it was great. The perfect blend of sweet and tart. 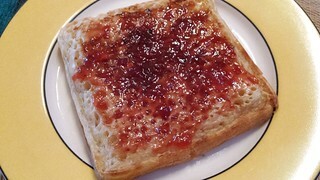 Strawberry jam is my favourite jam, but the added rhubarb component made it even better. I enjoyed it over crumpets. Also included was some locally made pasta. I was really excited to try this, because it was definitely a cut above the normal dried pasta I got from the supermarket. For maximum deliciousness, I had to make Cadry's own Garlic Butter Noodles with Red Wine Mushrooms, which she also enjoys with this pasta. Mine does not look as pretty as the photo on her blog, but I bet it was just as delicious! This was so simple and so tasty, a perfect way to enjoy this pasta. 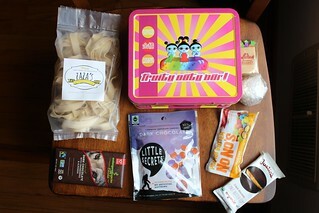 This was a wonderful package, full of sweet treats and local goodies that I enjoyed very much. Plus those erasers, almost too cute to use! And my nifty new lunch box. Thank you so much Cadry for such a fun box! You can see what I sent Cadry on her blog, here. What's the best food package you've received? And that is a wrap on VeganMoFo 2016! I hope you have enjoyed my posts, I have certainly enjoyed reading all of yours! Can we nap now? This photo is from several years ago, of me giving Possum a hug. You can tell he is totally into it. 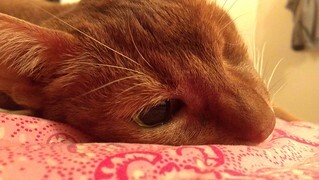 Possum was almost 20 years old when he passed away. We had a very close relationship when he was growing up, though when I went away to uni for 9 years, he switched his allegiance to my parents. He lived with my three girls for his final years after I moved home, and dealt with going from an only cat to having three cousins with exceptional grace. He was the most handsome boy that was ever handsome. 29th: Holiday Test Run – It’s always good to practice – show off your hits and misses. Like I said back on day 2 of VeganMoFo, I don't do practice runs of food before food related events. I just dive on it. So I thought I would present a history of Christmas Day roasts through the years. 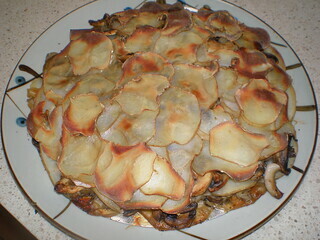 Holidays Past: When I first went vegan back in 2000, my beautiful mum found a delicious vegan potato and mushroom galette recipe. We made this recipe every year for years. Though it is quite time consuming, so we haven't made it the last several years because we are streamlining Christmas. I do love this, though. 2008: I remember this Christmas well. I was on call the night before, so didn't leave the clinic until 8am on Christmas morning. I was super sick, and so tired. 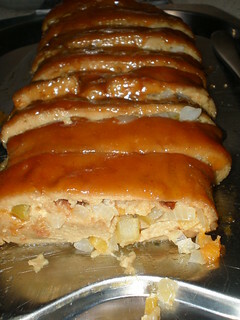 And went home and made a stuffed and glazed seitan roast before lunch. 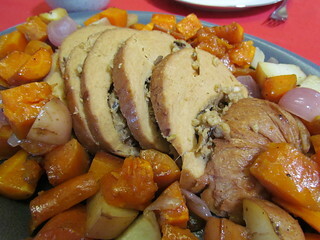 It was the Roast Seitan with Ginger Peach Stuffing and Glaze from Vegan Dad. I note in the original blog post that I didn't mention that I was sick, I guess I was sparing you the details. As for the roast, it was nice though the glaze was too sweet. But I was pretty impressed with myself. 2009: As time has gone on we have been big fans of simplifying Christmas. 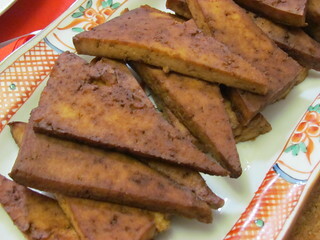 So this year I made marinated tofu. I don't know which recipe I used. 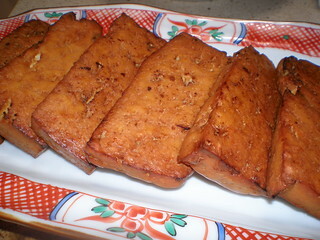 2010: 2010 continued the simple and easy route, with the delicious Soy-Glazed Tofu from 1000 Vegan Recipes. This recipe is so quick and simple and tasty, and goes with almost any meal you can think of. 2011 We are now entering the three lost years of blogging, where I didn't blog anything about Christmas. But I still have lots of photos. This was Gizmo's last Christmas at home, after a week in hospital, and shortly after she would go back to hospital for her final two weeks. So I was just in no blogging mood. 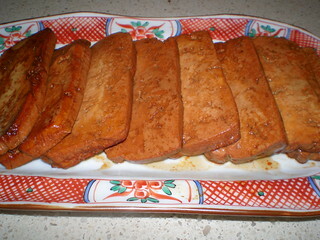 2011 saw more Soy-Glazed Tofu, I definitely didn't have a lot of time for fussy meals that year. Apparently I really like using this serving dish for tofu. 2012: My first Christmas without Gizmo, and my holiday spirit and cheer was non-existent. I decided to go even simpler and just buy a roast. 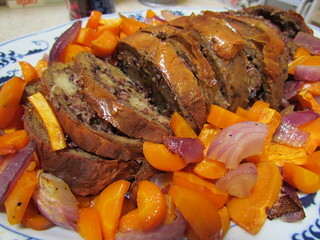 2012 was the first year that Tofurky hit Australia, and I made a roast with lots of veggies for Christmas. Not bad. 2013: This was the year of the Suzy Spoon Roast, which was actually delicious! 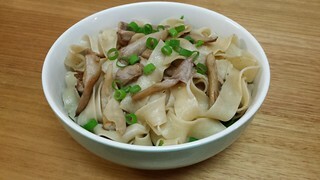 It is wrapped in yuba, giving it a delicious crispy skin. Definitely my favourite Christmas roast so far. I had to mail order this, and because the courier was an idiot they didn't deliver it until the following day. It was OK, we didn't get sick, but not ideal. So I didn't order one again. However Suzy Spoon's is now rolling out their products into vegan shops around Australia, so I may be able to get one again one day without worrying about courier times. 2014: Christmas blogging is back! 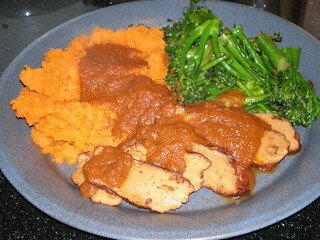 This year I went back to my vegan roots, with a Sanitarium Vegie Delight Roast. This is available in supermarkets, and was probably the first vegan roast that came out in Australia. It is very simple, not filled at all. 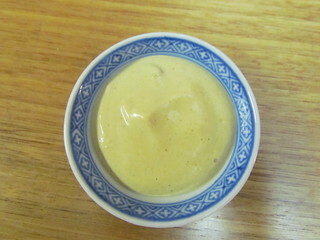 It comes with a lurid orange powder to make a glaze, which I now avoid and just use a bit of soy and olive oil. It isn't fancy, but it hits a nostalgic spot with me. Plus, easy availability to all and not as expensive as the other ones (though very small). In 2015 we also had a second Christmas, because my brother came home from the UK a week afterwards. 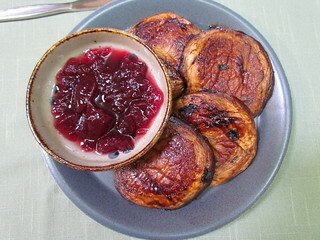 This was a very simple and fresh meal, and the centerpiece was beautiful seared mushrooms glazed in HP sauce. 2015: Last year I ordered a Vegan Meals Delivered roast. I am sorry to say that this was not the best. It was so bready and heavy. There is actually some stuffing in there, but it is just very small. I actually gave it a better review in the original blog post that I would in retrospect today. As for 2016, I am excited to say that I have a Field Roast fancy roast currently waiting in my freezer for the big day. Field Roast is my favourite plant based meat company, so I can't wait! What is your favourite sort of 'roast'? A bit out of order from the routine of going through my kitties, but I spoke so much about Gizmo in this post that I couldn't not make this about her. 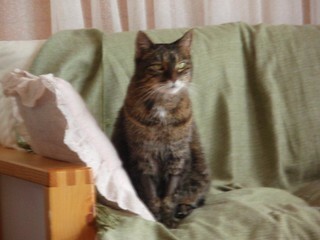 Gizmo passed away in January 2012, and I had her home for a glorious Christmas week in 2011 (which I thankfully had almost entirely off work). 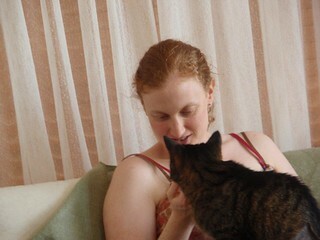 The first photo is one of my favourite photos of the two of us. I know the second one is a bit blurry, but I actually think it worked out kind of pretty. I love Gizmo so much, and I miss her everyday. VeganMoFo 2016 #28: Holiday baking. 28th: Holiday Bake Day! – What are you planning on baking over the winter holidays? Do you make cake, or cookies? Or something savoury? I used to do a lot of baking just for fun, and to take to work, and to eat. Not so much anymore. 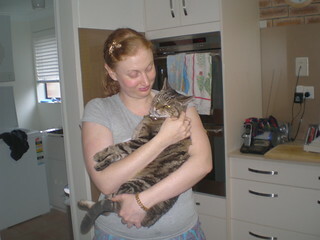 I lost my baking mojo in a massive way during and after Gizmo's passing, and I have never quite recovered it. I still bake, especially for things like bake sales, but nowhere near as much for fun random baking as I used to do. So I don't do a lot of Christmas baking these days. The nice thing about a blog, when you blog consistently (which I haven't always), is that you get a nice time capsule of certain aspects of your life to look back on. 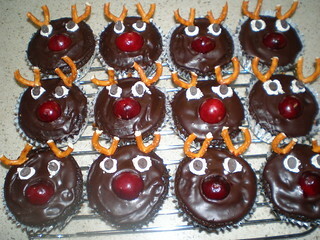 For example, I can see that 2008 I had a big Christmas bake-a-thon, which included these cute reindeer cupcakes. 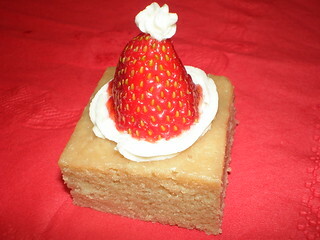 I also made these adorable Strawberry Santa Hats the same year, and the year after. These really are very good, should do it again. By the way, both of the recipes above came from the wonderful Wing It Vegan blog. My next big Christmas bake-a-thon apparently didn't happen until 2014. I don't often feel the so called Christmas spirit anymore, but apparently in 2014 I had a stirring, so I put it to good use baking. 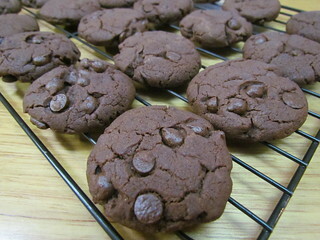 I stuck to pretty simple things, like these Chocolate Gingerbread Cookies from Isa Does It. Gingerbread and ginger cookies are some of my very favourite cookies. As opposed to gingerbread men, which I can take or leave. 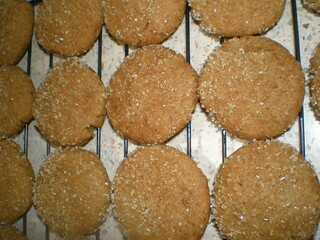 My favourite ginger cookie recipe is the Sparkled Ginger Cookies from Vegan With A Vengeance. I have made these so many times, though sadly not recently. This year I am not planning any huge baking extravaganzas. I am tired, which is boring because I know we are all tired, but I am. I will be working right up until Christmas Eve afternoon, because I only get public holidays off, so I won't have time to do heaps of Christmas prep. Plus I have a bake sale next weekend, that is using up all of my current baking focus. So instead I am dipping into the convenient world of pre-packaged vegan christmas-style goodies! 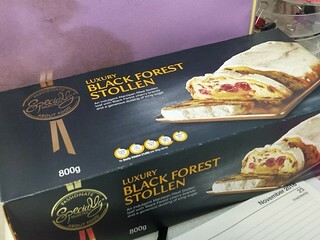 I was super excited to find the fabled vegan stollen at Aldi. I love stollen but haven't had it since before going vegan! I also have two types of ginger cookies to enjoy. 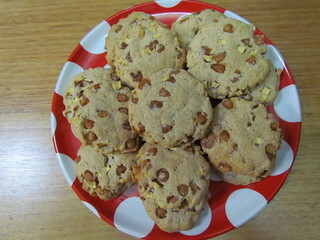 The big cookies are from Smith & Deli, I bought them in Melbourne in November. 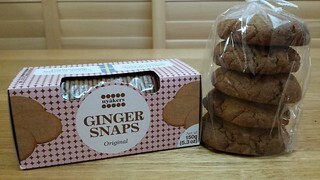 And the ginger snaps are a random pack my mum bought that happen to be vegan. What is your favourite thing to bake for the holidays? Or your favourite packaged treat if you don't have the time? Sweet little Pascall, my fourth kitty. We didn't get to be together for very long, it broke my heart (and ended my childhood dream to be a vet... though obviously I came back to that later in life), but it was so sweet while it lasted. This little girl would sleep in my bed, under the covers with her head on the pillow. It was good times. VeganMoFo 2016 #27: Coriander and challenging genetics. 27th: Changed Opinion – Was there a food you used to hate, and now don’t? Let's talk about my newfound love of capsicum. Haha, just kidding. Friends know that I detest capsicum with a certain hate that can only be reserved for the devil vegetable sent from the fiery pits of hell to ruin good food that capsicum is. Oh no, there will be no salvaging that relationship. So instead lets talk about fresh coriander (or cilantro, for my US friends). For years and years I could not abide fresh coriander, it tasted like someone was spraying soap up my nostrils. Even if I picked it off as a garnish, I could still taste its sudsy residue on my food. Gross. I used to sub in either parsley or mint for it in recipes, depending on what seemed appropriate. One day I decided that I should try and love coriander because it was in so many recipes. I set about making a plan as to how I would introduce it in a non-threatening non-soapy way, and work from there. And hopefully one day I would love it. 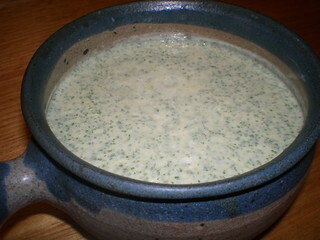 The recipe I chose was Cilantro Sour Cream from Veganomicon. This is some sort of magic recipe, because I loved it! And just like that, I could eat coriander. In fact, I love coriander now. And not just blended or cooked into things, I will liberally garnish it on top of things or throw it in salads. Oh coriander, you are so tasty! This could just be a simple tale of changing my mind about a food, but it gets more interesting. Coriander hating has been linked to genetics. Some people are genetically predisposed to find that coriander tastes like soap! Basically, I may have changed my genetics. Hello, I am the silliest superhero ever. I took my one shot and changing my genetics, and I used it up so I could like coriander. Fear me! Actually, this article talks about some of the other reasons people might not like coriander, and that you can change your preferences sometimes, so maybe I just did that. Though I like my superhero genetic theory better. What is your super obscure superpower? 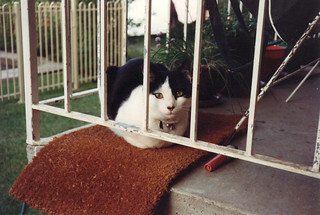 Gosh, our old verandah sure did give us lots of pretty photos of cats gazing through the bars. My third cat Patches, looking very handsome. We had our gentle giant for three and a half glorious years before he left us when I was in grade 7. 26th: Cookbooks – Show us your favourite cookbooks! I have a slight cookbook addiction. I currently own over 100 vegan cookbooks, and I have more on the way. I just love them! And I certainly use them. I am trying to cook everything in all of them! Anyway, to have me pick a favourite is pretty hard, because I love many of them so so so much. Sure, there are some that I am not so fond of, and ones I don't use that often, but I am pretty in love with a lot of them. So this is a very hard prompt to narrow it down. But narrow it down I have. I am going to present to you five very loved cookbooks. I can't say I don't have others that I also love just as much, but these are standouts for me. I also decided that I would not double up on authors in the list of five. This was hard. OK, here we go. In alphabetical order. For each book I will also share a favourite five star ':D' recipe photo, though this doesn't mean that it is my favourite recipe from the book! Appetite for Reduction by Isa Chandra Moskowitz. Ugh, you guys, how do you pick a favourite Isa cookbook? They are all so amazing! VWAV has a super special place in my heart, of course. But for choice of favourite it really came down to Appetite For Reduction and Isa Does It. But Appetite For Reduction won out by a hair. See all my Appetite For Reduction recipe round-ups here. Eat, Drink, and Be Vegan by Dreena Burton. This is hands down my favourite Dreena cookbook! Let Them Eat Vegan comes a solid second out of her collection. See all my Eat, Drink, and Be Vegan recipe round-ups here. 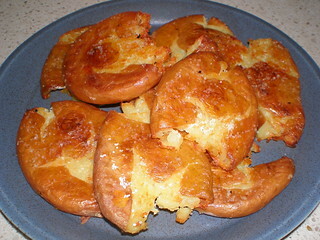 A favourite recipe: Potato Squashers. A must for every Christmas! Keep It Vegan by Aine Carlin. I picked up this book on special at an actual bookstore last year, and it quickly became one of my favourites. 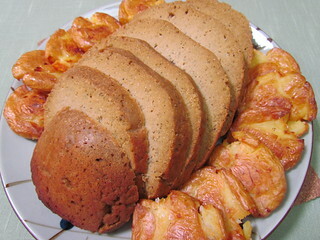 The recipes are so delicious! I also have her new book, The New Vegan, which is lovely. But I cannot recommend Keep It Vegan enough! 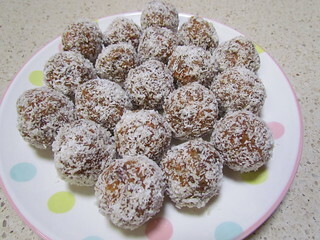 See the food I have made from Keep It Vegan by clicking here. Quick Fix Vegan by Robin Robertson. I love Robin Robertson a lot. She has written so many great cookbooks, plus she is an awesome cat lady! I first came across her when I found Vegan Planet, and 1000 Vegan Recipes is a personal life-long challenge for me. Vegan Without Borders is so beautiful, plus she has so many other books that are great. 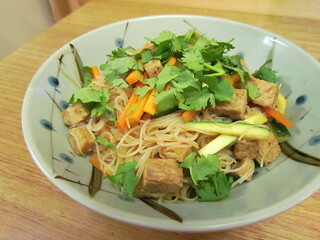 But the Quick-Fix series is the one I recommend to people who are looking for simple and tasty vegan food. All the food can be prepared in 30 minutes or less. So great! Quick-Fix Vegan is the second in the Quick-Fix series, I also have Quick-Fix Vegetarian (which is all vegan) and More Quick-Fix Vegan. See all my Quick-Fix Vegan round-ups here. The Abundance Diet by Summer McCowan. This book came at a time when I really needed to sort out my eating a bit, and I am so grateful that it did. This book is packed full of delicious and tasty recipes. You can follow it as a 4 week diet if you wish, or just dip in and out of it as I have. But there is certainly no lack of flavour or variety here. See all my posts for The Abundance Diet here. As I said, I cannot pick a favourite vegan cookbook. I can't even say that these are my top five cookbooks. They are just five books that I really love out of a huge pool of books that I love. Even as I was writing this I thought of others I wanted to add in, but I stayed firm in my initial picks to share with you so that this didn't spiral out of control into the longest post ever! How many vegan cookbooks do you have? We only have four photos of Max ever, and this is the last of them. 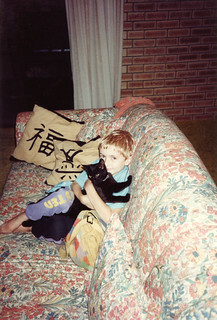 My brother Greg giving him a hug. 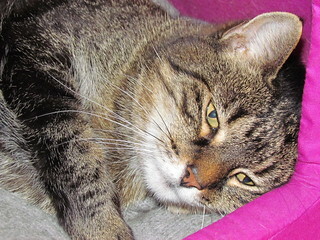 Max was only with us for six short weeks before he was found passed away. He was a little wild kitty at heart. 25th: Vegan Memories – What was your first vegan meal? Or the one you remember the most? I am pretty terrible, I have no idea what my first vegan meal was. I had a couple of failed attempts at veganism, but then decided that third time would be a charm. I went off to do prac work and took only vegan food with me (well, what I thought was vegan food, I am sure there were ingredients in there that I didn't yet know about). But I don't really remember what that food was. Or what most of my first vegan meals were. I do remember that there was a potato soup I used to make a lot when I first started using my cookbooks, and there was also a lasagna I used to make (with Kingland vegan cheese... oh, it has a special place in my heart.) But then I remembered something way more fun. I am going to go back even further in time for a few years, to when I became vegetarian. Because I certainly remember the first thing that I ate when I went vegetarian. I went vegetarian for ethical reasons, but it would still be three years before I realised that eggs and dairy were horrible, that vegans aren't extreme, and that I can indeed live without cheese. Though these days there is so much fabulous vegan cheese available, I enjoy cheese far more than I ever have before! What was the first meal? I made a pizza. And while I don't remember exactly everything that was on the pizza, I remember that I put creamed corn on it. Because creamed corn is pretty delicious. I am pretty sure the rest of the ingredients on the pizza would have been vegan, except for the cheese. But that is an easy fix these days! 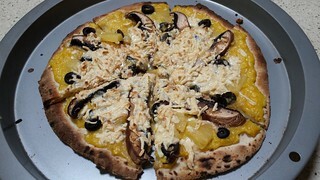 So here is my vegan creamed corn pizza. I bought a pizza base from the shops (they are not that great, but I didn't have time to make one from scratch), and I used creamed corn as my sauce for the base. 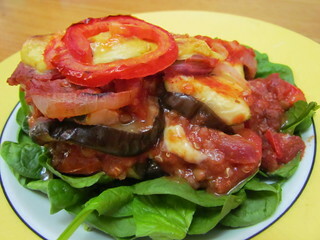 I topped this with some juicy slices of portobello, my favourite trashy black olives, and some pineapple. I am a devoted pineapple on pizza fan. I don't care what you say! I sprinkled a whole bunch of Daiya Mozzarella, and baked. It was really good, in a fabulous trashy kind of way. Go me! I think I have not eaten creamed corn on pizza since that day, but I think it should make a more regular appearance as a pizza topping from now on. So we come to our final cycle through kitties of my life. There are only six days left, so I will just be sharing the six who are no longer with me. Dim Sim and Sahara are still very much right here! I refer to this photo of Mo as her 'glamour shot'! 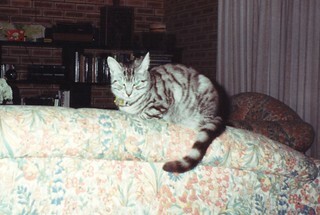 Mo was with us for 10 years, before a tragic accident took her from us. 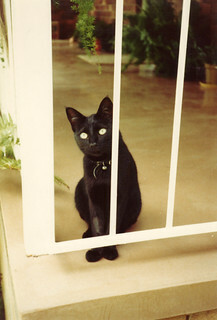 I credit this black beauty with kick-starting my life long love of cats, which spilled over into my love of animals. So probably Mo can take credit for me being a vegan today. A pretty good effort for a little black cat. VeganMoFo 2016 #24: A bowl of thanks. 24th: Thanksgiving – Americans, what are you making for Thanksgiving? 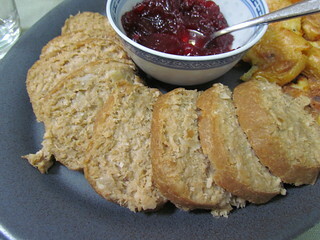 Non-Americans, have a go at making something thanksgiving inspired! Not being American, I have never done anything for Thanksgiving. Though I have watched a certain Buffy episode a lot. I do enjoy seeing everyone's food, though I draw the line at putting marshmallows on sweet potato and serving them as a side dish for the savoury part of the meal. Sorry America, but I think not. Originally I had big huge exciting plans to make one of the elaborate Thanksgiving menus from one of my cookbooks and invite people and call it a 'Catsgiving', where we all gave thanks for our cats. But time and effort were not on my side. I feel that is a theme of this MoFo. Such is life. So instead of making a huge many part meal, I made a bowl with several parts. 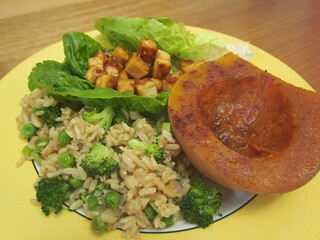 The Holiday Bowl from Vegan Bowls seemed to fit the bill. 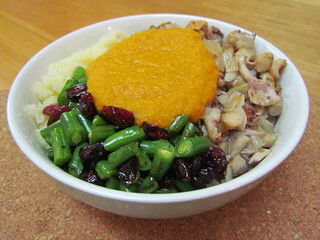 This is made up of four parts - a mushroom and bread stuffing, green beans, mashed potato cauliflower, and a carrot gravy. The stuffing is oyster mushrooms, bread (I only needed 2 1/2 slices to get the required weight), pecans and onions that are roasted until they are crunchy and brown. For the beans, the recipe calls to cut diagonally into thin strips, which look very pretty in the photo. I failed a this, so just chopped them on the diagonal. They taste the same! The beans are simply sauteed with salt and pepper and cranberries. The carrot gravy is tasty, though mine was a little textured as I used my immersion blender to blend it rather than dirty up my big blender. The only confusion thin in the recipe is that the first ingredients and the first step is for some broth. There is a few tsp of broth used in the stuffing to moisten (though I didn't use this because my mushrooms has released quite a lot of liquid), and then the ingredients for the gravy call for another cup of broth. I assume that the broth from the gravy should be the broth you have previously made. Anyway, it was a tasty and delicious bowl. Tell me your thoughts on this marshmallow sweet potato thing. Sahara is the most recent of my kitties to join me, and by recent I mean 13 years ago! We are in it together forever. :) Sometimes, she is very serious. 23rd: Autumn/Fall (or Spring if you’re in the Southern Hemisphere) Traditions – Are there any foods you traditionally make in this season? When this prompt was originally released, I am pretty sure it just mentioned fall traditions. Though they have updated it for spring as well for us people down south. However, my planning had already taken place, but it ended up kind of working for both! I don't really have any autumn or spring traditions as such, but whenever I think of autumn I always think of butternut squash and cranberries. Do I make lots of things with butternut squash or cranberries in autumn? No. But I think about them! However, as mentioned, I live in the southern hemisphere. Where it is Spring, though in Brisbane's case it has already started edging into summer. When the weather gets hot, I love starting to look at big meal-sized salads. And here is where the two shall meet. Delicata Squash, Millet & Kale Salad with Lemon-Tahini Dressing from The Oh She Glows Cookbook piqued my interest because squash and cranberries! I have never seen delicata squash here, so replacing it with butternut was a given. The recipe calls for a cup of dried millet to be cooked, and I only used half that amount (I also used a millet and quinoa blend because I ran out of millet), which ended up still being way too much grain for the salad. If you used the whole cup of dried grain, it would end up being a huge grain salad! Which could be cool. The ingredients are layered to make a beautiful salad. The bottom layer is kale rubbed with some dressing. I did blanch my kale slightly, because I find that sometimes raw kale salads make my stomach hurt a little,and I mixed in some fresh baby spinach too. 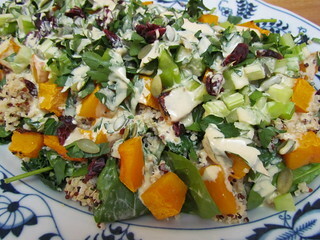 This is topped with the millet, celery, parsley, roasted butternut, cranberries, pepitas and then the dressing. It also calls for raw onions, which I left out because I don't like raw onion. Though I noticed a tip for roasting the onion with the butternut, which would have been lovely. The dressing comes together very quickly, and is tasty and tangy. This is meant to be served as a warm autumn salad, but because it is spring here I left everything cool before assembling. It was a lovely mix of flavours and textures, enjoyed by everyone! 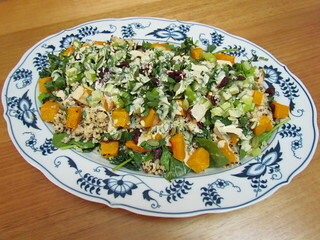 I feel that I successfully made an autumn-inspired dish in a spring-appropriate manner, so my work here is done! What is your favourite season? And your favourite food associated with that season? When I review recipes from cookbooks, they get a smiley face rating, and this is what they mean. I have two great loves in my life. Firstly are the wonderful beings that are kitty cats. Second is vegan cooking in all its forms. So don't freak out if you find a stray cat hair settled into your cupcake. I am a cat vet and I am also lucky enough to share my life with my fabulous girls - Dim Sim (small and black) and Sahara (cinnamon Abyssinian). Also my angel cat Gizmo, who may have left us but is never forgotten. I've been a vegan since September 2000, and haven't looked back since! I don't really make my own recipes, what I do like to do is make other people's recipes (I have shelves of vegan cookbooks) or eat out, take photographs and then share the results. VeganMoFo 2016 #21: To market to market! VeganMoFo 2016 #19: Goth Night! VeganMoFo 2016 #15: Taste the rainbow in a bowl. VeganMoFo 2016 #14: Pretty in Pink? 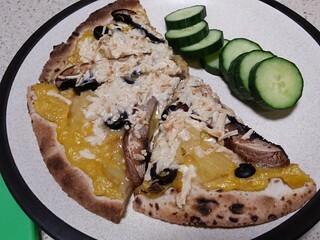 VeganMoFo 2016 #1: Pizza party!